Description: The aftermath of the 2009 typhoon Ondoy left this critical watershed reserve in the limelight, drawing much attention to the denuded state of its forest cover. FPE commissioned a research effort in Boso-Boso and Tayabasan, two of the four sub-watersheds of the site, where an approach that covers both biophysical and the socio-economic dimensions was applied. TourismLivelihood ResourcesDumagats are the original inhabitants of the subwatersheds and are currently reinforcing their land claims through Certificate of Ancestral Domain Title (CADT) application.Indigenous Populations95 species of birds have been recorded in the Boso-Boso watershed, 49 of which are resident species (those that breed or are suspected to breed in the country). Six of the 95 species are globally threatened or near threatened. In the Tayabasan subwatershed, 74 species of birds have been recorded. Five of these are categorized as vulnerable or near threatened. Ten of the 25 reptile and amphibian species in Boso-Boso are endemic to the Philippines, four of which are found only in Luzon. The giant Marine toad (Bufomarinus), an introduced exotic, was found in the secondary growth lowland forest. In Tayabasan, 10 of 23 herpetofaunal species were recorded, with 10 endemics to the Philippines (6 endemic to Luzon). Four out of fifteen species of mammals observed in Boso-Boso are endemic to the Philippines, with another one being endemic only to Luzon. Ten recorded mammals in Tayabasan include the Philippine Pygmy Fruit Bat as the lone Philippine endemic species. The Boso-Boso and Tayabasan rivers within the UMRBPL host various freshwater fish species which are reportedly caught for home consumption. These include carpa or carp (Cyprinus carpio), biya or goby (Glosso gobiusgiuris), igat or eel (Anguilla sp), palos or snake eel (Ophichthus spp), dalag or snakehead (Channa striata), hito or catfish (Clarias spp), and buringring or guppy (Poecilia spp). Invertebrate species caught and reportedly consumed by residents include shrimps and crabs.FaunaAn estimate of 80% denudation is considered for the UMRBPL’s forest cover. 67 of the 178 (38%) plant species in the site were found to be endemic to the Philippines, with six found only in Luzon and 31 listed as globally threatened. Floral surveys conducted in 2011 revealed six plant species within the Boso-Boso and Tayabasan subwatersheds that were not previously known to occur in the Rizal province.FloraOne of Metro Manila’s primary sources of water for production, domestic, and industrial consumption, and transportation. Mining as a source of livelihood. Logging of the highly sought-after dipterocarp family found in the site. Steep slopes which are prone to erosion, landslides, and flooding. Two geological fault lines bordering the Boso-Boso and Tayabasan Subwatersheds are considered earthquake-prone. Population growth rate in Brgys. Calawis and San Jose (7.6%) is much higher than the national average (2.04%) as of 2010, partly attributed to migration from other provinces. This in turn puts increasing pressure on the area’s natural resource base. 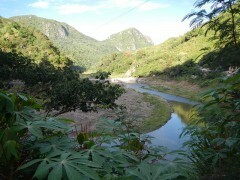 Baseline research on the natural resource and socio-economic profiles of the Boso-Boso and Tayabasan sub-watersheds of the Upper Marikina River Basin Protected Landscape to provide key information around which to design further BCSD initiatives, including management recommendations for the protected area. Production of an FPE knowledge product, volume 16 of the KALIKASAN BCSD Knowledge Series. Foundation for the Philippine Environment. 2014. Waters Flowing or Flooding? Working for the Future of the Upper Marikina Watershed (KALIKASAN BCSD Series Sixteen). Quezon City, Philippines: Foundation for the Philippine Environment.